Welcome to my website. I am an animal artist working in pastels, charcoal and oils. As well as exhibiting in galleries I have for a number of years been submitting my artwork to national exhibitions, the latest being Southern Nature Art Exhibition. I am delighted to say that this year's event was very well attended and very successful in raising funds for Brent Lodge Wildlife Hospital, a voluntary organisation treating and rehabilitating sick, injured and orphaned wildlife. I am also very pleased to say that my Scottish Wildcat painting 'Clearing Mist' won the public vote for 2018. Inspiration for my artwork virtually always comes from observing animals, especially cats - from domestic cats to wildcats. However, over the years my subjects have been wide and varied from a commission to paint a farmer’s favourite cow to a painting of a rescued cheetah. I have also worked in the giftware industry and my images have been published internationally on a variety of products. For a number of years I lived in North Devon with my husband, German Shepherd and three cats. We lived in an area frequently referred to as Tarka country and whilst living there paintings of otters regularly featured on my easel. When swimming otters are fascinating to watch, they make lovely curving shapes and are so wonderfully fluid. 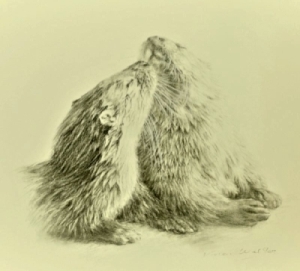 Otters are also very playful and move fast which makes them very difficult to sketch whilst in action and even photography can be challenging. Cats are much easier to sketch and photograph especially when the sun is shining and they find a warm spot to curl up. Kittens however when awake are always on the move. Last year we decided to relocate to the Somerset/Dorset border, an area abounding with wildlife. Having models on the doorstep means that I can regularly study their antics and I am always mentally working out new images. Our visitors vary from foxes, deer, squirrels and badgers plus the odd pheasant and nearby there are many varieties of wild ducks, egrets and swans which look stunning against the sparkling blue water.